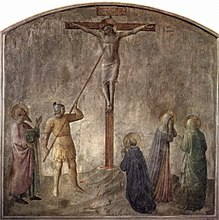 The Holy Lance (also known as the Holy Spear, Spear of Destiny, Lance of Longinus, or Spear of Longinus) is the name given to the lance that pierced the side of Jesus as he hung on the cross, according to the Gospel of John. One of the soldiers pierced his side with a lance (λογχη), and immediately there came out blood and water.The lance (Greek: λογχη, longche) is mentioned only in the Gospel of John (19:31–37) and not in any of the Synoptic Gospels. The gospel states that the Romans planned to break Jesus' legs, a practice known as crurifragium, which was a method of hastening death during a crucifixion. Just before they did so, they realized that Jesus was already dead and that there was no reason to break his legs. To make sure that he was dead, a Roman soldier (named in extra-Biblical tradition as Longinus) stabbed him in the side. The phenomenon of blood and water was considered a miracle by Origen. Catholics, while accepting the biological reality of blood and water as emanating from the pierced heart and body cavity of Christ, also acknowledge the allegorical interpretation: it represents one of the main key teachings/mysteries of the Church, and one of the main themes of the Gospel of Matthew, which is the homoousian interpretation adopted by the First Council of Nicaea, that "Jesus Christ was both true God and true man." The blood symbolizes his humanity, the water his divinity. A ceremonial remembrance of this is done when a Catholic priest says Mass: The priest pours a small amount of water into the wine before the consecration, an act which acknowledges Christ's humanity and divinity and recalls the issuance of blood and water from Christ's side on the cross. Saint Faustina Kowalska, a Polish nun whose advocacy and writings led to the establishment of the Divine Mercy devotion, also acknowledged the miraculous nature of the blood and water, explaining that the blood is a symbol of the divine mercy of Christ, while the water is a symbol of His divine compassion and of baptismal waters. Crucifixion miniature, Rabula Gospels, with the legend "Loginos"
The name of the soldier who pierced Christ's side with a longche is not given in the Gospel of John, but in the oldest known references to the legend, the apocryphal Gospel of Nicodemus appended to late manuscripts of the 4th century Acts of Pilate, the soldier is identified as acenturion and called Longinus (making the spear's "correct" Latin name Lancea Longini). A form of the name Longinus occurs on a miniature in the Rabula Gospels (conserved in the Laurentian Library, Florence), which was illuminated by one Rabulas in the year 586. In the miniature, the name LOGINOS (ΛΟΓΙΝΟC) is written in Greek characters above the head of the soldier who is thrusting his lance into Christ's side. This is one of the earliest records of the name, if the inscription is not a later addition. There have been three or four major relics that are claimed to be the Holy Lance or parts of it. The Holy Lance in Rome is located beneath the dome of Saint Peter's Basilica, although the Catholic Church makes no claim as to its authenticity. The first historical reference to the lance was made by the pilgrim Antoninus of Piacenza (AD 570) in his descriptions of the holy places ofJerusalem, writing that he saw in the Basilica of Mount Zion "the crown of thorns with which Our Lord was crowned and the lance with which He was struck in the side". A mention of the lance occurs in the so-called Breviarius at the Church of the Holy Sepulchre. The presence in Jerusalem of the relic is attested by Cassiodorus (c. 485–585) as well as by Gregory of Tours (c. 538–594), who had not actually been to Jerusalem. 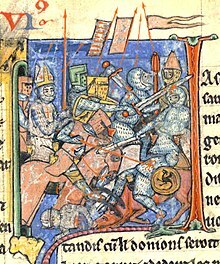 As for the larger portion of the lance, Arculpus claimed he saw it at the Church of the Holy Sepulchre around 670 in Jerusalem, but there is otherwise no mention of it after the sack in 615. Some claim that the larger relic had been conveyed to Constantinoplein the 8th century, possibly at the same time as the Crown of Thorns. At any rate, its presence at Constantinople seems to be clearly attested by various pilgrims, particularly Russians, and, though it was deposited in various churches in succession, it seems possible to trace it and distinguish it from the relic of the point. Sir John Mandeville declared in 1357 that he had seen the blade of the Holy Lance both at Paris and at Constantinople, and that the latter was a much larger relic than the former; it is worth adding that Mandeville is not generally regarded as one of the Middle Ages' most reliable witnesses, and his supposed travels are usually treated as an eclectic amalgam of myths, legends and other fictions. "The lance which pierced Our Lord's side" was among the relics at Constantinople shown in the 1430s to Pedro Tafur, who added "God grant that in the overthrow of the Greeks they have not fallen into the hands of the enemies of the Faith, for they will have been ill-treated and handled with little reverence." 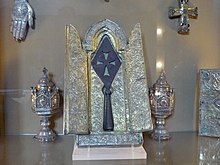 Whatever the Constantinople relic was, it did fall into the hands of the Turks, and in 1492, under circumstances minutely described in Pastor's History of the Popes, the Sultan Bayezid II sent it to Pope Innocent VIII to encourage the pope to continue to keep his brother and rival Zizim (Cem Sultan) prisoner. At this time great doubts as to its authenticity were felt at Rome, as Johann Burchard records, because of the presence of other rival lances in Paris (the point that had been separated from the lance), Nuremberg (see Holy Lance in Vienna below), and Armenia (see Holy Lance in Echmiadzin below). 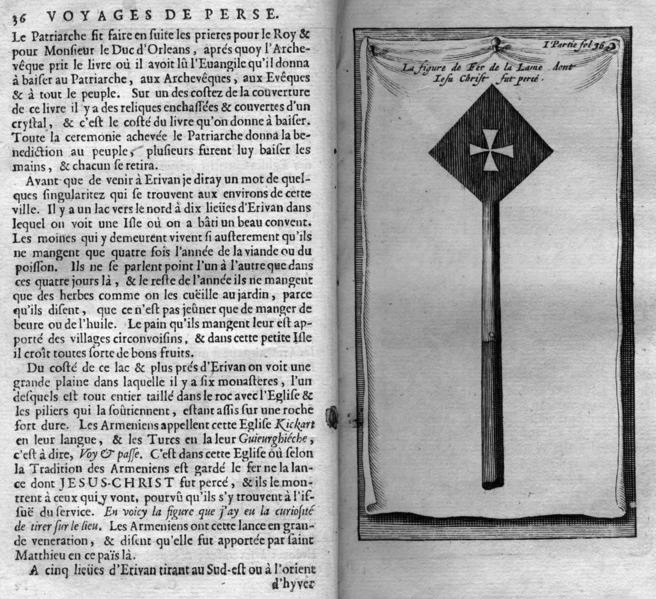 In the mid-18th century Pope Benedict XIV states that he obtained from Paris an exact drawing of the point of the lance, and that in comparing it with the larger relic in St. Peter's he was satisfied that the two had originally formed one blade. This relic has never since left Rome, where it is preserved under the dome of Saint Peter's Basilica, although the Church makes no claim as to its authenticity. The Holy Lance in Vienna is displayed in the Imperial Treasury at the Hofburg Palace in Vienna, Austria. In the tenth century, the Holy Roman Emperors came into possession of the lance, according to sources from the time of Otto I (912–973). In 1000, Otto III gave Boleslaw I of Poland a replica of the Holy Lance at the Congress of Gniezno. In 1084, Henry IV had a silver band with the inscription "Nail of Our Lord" added to it. This was based on the belief that this was the lance of Constantine the Great which enshrined a nail used for the Crucifixion. In 1273, the Holy Lance was first used in the coronation ceremony. Around 1350, Charles IV had a golden sleeve put over the silver one, inscribed Lancea et clavus Domini (Lance and nail of the Lord). In 1424, Sigismund had a collection of relics, including the lance, moved from his capital in Prague to his birthplace, Nuremberg, and decreed them to be kept there forever. This collection was called the Imperial Regalia (Reichskleinodien). When the French Revolutionary army approached Nuremberg in the spring of 1796 the city councilors decided to remove the Reichskleinodien to Vienna for safe keeping. The collection was entrusted to one "Baron von Hügel", who promised to return the objects as soon as peace had been restored and the safety of the collection assured. However, the Holy Roman Empire was disbanded in 1806 and the Reichskleinodien remained in the keeping of the Habsburgs. When the city councilors asked for the Reichskleinodien back, they were refused. As part of the imperial regalia it was kept in the Imperial Treasury and was known as the lance of Saint Maurice. Dr. Robert Feather, an English metallurgist and technical engineering writer, tested the lance for a documentary in January 2003. He was given unprecedented permission not only to examine the lance in a laboratory environment, but was allowed to remove the delicate bands of gold and silver that hold it together. In the opinion of Feather and other academic experts, the likeliest date of the spearhead is the 7th century A.D. – only slightly earlier than the Museum's own estimate. However, Dr. Feather stated in the same documentary that an iron pin – long claimed to be a nail from the crucifixion, hammered into the blade and set off by tiny brass crosses – is "consistent" in length and shape with a 1st century A.D. Roman nail. According to Paul the Deacon, the Lombard royal line bore the name of the Gungingi, which Karl Hauck and Stefano Gasparri maintain identified them with the name of Odin’s lance, Gungnir (a sign that they probably claimed descent from Odin, as did most of the Germanic royal lines). Paul the Deacon notes that the inauguration rite of a Lombard king consisted essentially of his grasping of a sacred/royal lance. Milan, which had been the capital of the Western Roman Empire in the time of Constantine, was the capital of the Lombard kings Perctarit and his son Cunipert, who became Catholic Christians in the 7th century. Thus it seems possible that the iron point of the Lombardic royal lance might have been recast in the 7th century in order to enshrine one of the 1st century Roman nails that St. Helena was reputed to have found at Calvary and brought to Milan, thus giving a new Christian sacred aura to the old pagan royal lance. If Charlemagne’s inauguration as the King of the Lombards in 774 had likewise included his grasping of this now-Christianized sacred or royal lance, this would explain how it would have eventually become the oldest item in the German imperial regalia. The Iron Crown of Lombardy (dated to the 8th century), which eventually became the primary symbol of Lombardic kingship, takes its name from the tradition that it contains one of the holy nails. Gregory of Tours in his Libri Historiarum VII, 33, states that in 585 the Merovingian king Guntram designated his nephew Childebert II his heir by handing him his lance, it is possible that a royal lance was a symbol of kingship among the Merovingian kings and that a nail from Calvary was in the 7th century incorporated into this royal lance and thus eventually would have come into the German imperial regalia. The Holy Lance in Echmiadzin (Armenian: Geghard) is conserved in Vagharshapat, Armenia (Echmiadzin), the religious capital of the country. The first source that mentions it is a text Holy Relics of Our Lord Jesus Christ, in a thirteenth century Armenian manuscript. According to this text, the spear which pierced Jesus was to have been brought to Armenia by the Apostle Thaddeus. The manuscript does not specify precisely where it was kept, but the Holy Lance gives a description that exactly matches the lance, the monastery gate, since the thirteenth century precisely, the name of Geghardavank (Monastery of the Holy Lance). In 1655, the French traveler Jean-Baptiste Tavernier was the first Westerner to see this relic in Armenia. In 1805, the Russians captured the monastery and the relic was moved to Tchitchanov Geghard, Tbilisi, Georgia. It was later returned to Armenia at Echmiadzin, where it is always visible to the museum Manougian, enshrined in a seventeenth century reliquary. This Holy Lance in Echmiadzin has never been a weapon. Rather, it is the point of a sigillum, perhaps Byzantine, with a diamond-shaped iron openwork Greek cross. Therefore, this lance, which is held by the Nestorian Church, could not be the actual Lance of Longinus of the Bible. During the June 1098 Siege of Antioch, a poor monk Peter Bartholomew reported that he had a vision in which St. Andrew told him that the Holy Lance was buried in the Church of St Peter in Antioch. After much digging in the cathedral, Peter apparently discovered a lance. Despite the doubts of many including the papal legate Adhemar of Le Puy, the discovery of the Holy Lance of Antioch inspired the starving Crusaders to break the siege and secure the city. Another lance has been preserved at Krakow, Poland, since at least the 13th century. However, German records indicate that it was a copy of the Vienna lance. Emperor Henry II had it made with a small sliver of the original lance. Another copy was given to the Hungarian king at the same time. The story told by William of Malmesbury of the giving of the Holy Lance to King Athelstan of England by Hugh Capet seems to be due to a misconception. In his opera Parsifal, Richard Wagner identifies the Holy Spear with two items that appear in Wolfram von Eschenbach's medieval poem Parzival, a bleeding spear in the Castle of the Grail and the spear that has wounded the Fisher King. The opera's plot concerns the consequences of the spear's loss by the Knights of the Grail and its recovery by Parsifal. Having decided that the blood on the Spear was that of the wounded Saviour – Christ is never named in the opera – Wagner has the blood manifest itself in the Grail rather than on the spearhead. The "Spear of Destiny" is a name given to the Holy Lance in various accounts that attribute mystical powers to it. Many of these have originated in recent times, and several popular New Age and conspiracy theory books have popularized the legend of the Spear. Trevor Ravenscroft's 1973 book, The Spear of Destiny (as well as a later book, The Mark of the Beast), claims that Adolf Hitler started World War II in order to capture the spear, with which he was obsessed. At the end of the war the spear came into the hands of US GeneralGeorge S. Patton. According to legend, losing the spear would result in death, and that was fulfilled when Hitler committed suicide. Dr. Howard A. Buechner, M.D., professor of medicine at Tulane and then Louisiana State University, wrote two books on the spear. Buechner was a retired colonel with the U.S. Army who served in World War II and had written a book about the Dachau massacre. He claims he was contacted by a former U-boat submariner, the pseudonymous “Capt. Wilhelm Bernhart,” who claimed the spear currently on display in Vienna is a fake. "Bernhart" said the real spear was sent by Hitler to Antarctica along with other Nazi treasures, under the command of Col. Maximilian Hartmann. In 1979 Hartmann allegedly recovered the treasures. Bernhart presented Buechner with the log from this expedition as well as pictures of the objects recovered, claiming that after the Spear of Destiny was recovered, it was hidden somewhere in Europe by a Nazi secret society. After contacting most of the members of the alleged expedition and others involved, including Hitler Youth Leader Artur Axmann, Buechner became convinced the claims were true. Another theory is that the real spear was on board the German U-boat U-534 which was the last U-boat that departed from the harbour of Kiel, Germany, in the final days of World War II and was sunk nearby the Danish island of Anholt by a Royal Air Force bomber on 5 May 1945. This claim, however, has been disputed by Danish businessman Karsten Ree who financed the salvage of U-534 in 1993. ^The text is Syriac, the lettering Greek. ^ Thurston, Herbert (1910). "The Holy Lance". The Catholic Encyclopedia. Vol. 8. New York: Robert Appleton Company, 1910. ^ Cassiodorus, Expositio in Psalterium (Explanation of the Psalms) lxxxvi, (printed in Migne, Patrologia Latina, LXX, 621). ^ The later history is reported from the Catholic Encyclopedia. ^ "Pedro Tafur, ''Andanças e viajes ''". Depts.washington.edu. Retrieved 2012-01-21. ^ This effort was documented in a TV special for BBC/Discovery Channel called Spear Of Christ, narrated by Cherie Lunghi, written and directed by Shaun Trevisick.Atlantic Productions, aired 31 March 2002..
^ "Agelmund, the son of Aio first reigned over them, tracing out of his pedigree the stock of the Gungingi which among them was esteemed particularly noble." (Paul the Deacon, Historia Langobardorum i.14 [ " on-line text ]. Paul does not associate Gungingi with the spear Gungnir, however. ^ “Herrshaftszeichen eines wodanistisches Königtums“, Jahrbuch fur frankische Landesforschung 14 (1966), pp. 9-66. ^ Beckett, Lucy (1981). Richard Wagner: Parsifal. Cambridge University Press. pp. 16–17. ISBN 0-521-29662-5. ^ Ravenscroft, Trevor (1982). The Spear of Destiny. Weiser Books. ISBN 0-87728-547-0. ^ Ravenscroft, Trevor; Tim Wallace-Murphy (1997 (reprint)). The Mark of the Beast: The Continuing Story of the Spear of Destiny. Weiser Books. ISBN 0-87728-870-4. ^ Buechner, Howard A; Bernhart, Wilhelm (1988). Adolf Hitler And The Secrets Of The Holy Lance. Thunderbird Press., Buechner, Howard A; Bernhart, Wilhelm (1989).Hitler's Ashes – Seeds Of A New Reich. Thunderbird Press. ^ "Ekstremdykning - dr.dk/DR2/Temaaften/Udsendelser/lørdag". Dr.dk. 2010-08-04. Retrieved 2012-01-21. Childress, David Hatcher. Pirates and the Lost Templar Fleet: The Secret Naval War Between the Knights Templar and the Vatican. Adventures Unlimited Press, 2003. Crowley, Cornelius Joseph. The Legend Of The Wanderings Of The Spear Of Longinus. Heartland Book, 1972. Hone, William. The Lost Books of the Bible. Bell Publishing Co., 1979. Kirchweger, Franz, ed. Die Heilige Lanze in Wien. Insignie - Reliquie - Schicksalsspeer [The Holy Lance in Vienna. Insignia - Relic - Spear of Destiny]. Vienna: Kunsthistorisches Museum, 2005. Kirchweger, Franz. "Die Geschichte der Heiligen Lanze vom späteren Mittelalter bis zum Ende des Heiligen Römischen Reiches (1806) [The History of the Holy Lance from the Later Middle Ages to the End of the Holy Roman Empire (1806)]." Die Heilige Lanze in Wien. Insignie - Reliquie - Schicksalsspeer. Vienna: Kunsthistorisches Museum, 2005, 71-110. MacLellan, Alec. The Secret of the Spear: The Mystery of the Spear of Longinus. Souvenir Press, 2005 (Reprint). Rutman, Leo. Spear Of Destiny: A Novel. Pinnacle Books, 1989. Schier, Volker and Corine Schleif. "The Holy Lance as Late Twentieth-century Subcultural Icon." Subcultural Icons, edited by Keyan Tomaselli and David Scott. Walnut Creek: Left Coast Press, 2009, 103-134. Schier, Volker and Corine Schleif. "Die heilige und die unheilige Lanze. Von Richard Wagner bis zum World Wide Web [The Holy and the Unholy Lance. From Richard Wagner to the World Wide Web]." Die Heilige Lanze in Wien. Insignie - Reliquie - Schicksalsspeer, edited by Franz Kirchweger. Vienna: Kunsthistorisches Museum, 2005, 111-144. Schier, Volker and Corine Schleif. "Seeing and Singing, Touching and Tasting the Holy Lance. The Power and Politics of Embodied Religious Experiences in Nuremberg, 1424-1524." Signs of Change. Transformations of Christian Traditions and their Representation in the Arts, 1000-2000, edited by Nils Holger Petersen, Claus Cluver, and Nicolas Bell. Amsterdam - New York: Rodopi, 2004, 401-426. Sheffy, Lester Fields. Use of the Holy Lance in the First Crusade. L.F. Sheffy, 1915.